This entry was posted on October 6, 2014 by Tinteán Editorial Team/EMcK, in Book review, History and tagged Australian Catholics; Australian History; The Catholic church in Australia; Edmund Campion; immigration. Bookmark the permalink. In a recent article in The Australian, (August 30-31 2014) Greg Craven, Vice-Chancellor of the ACU wrote that in order to counter the development of the home grown jihadist movement, the necessity of a strong ‘civic narrative’ – which he defines as ‘a nation’s case to its citizens that it is worthy of allegiance’, is of paramount importance. He argues that there are three main components of such a ‘national civic case’: the articulation of fundamental and attractive values underlying our society; ensuring that citizens understand the way in which they are governed and accept that it is generally fair; having a sufficient number of basic national stories, parables and symbols that encapsulate these propositions. Reading Australian Catholics Lives by Edmund Campion, it immediately becomes obvious these criteria are actually quietly humming away in the national consciousness in the past and present lives of ordinary -albeit Catholic! – Australians. Fr Campion recounts the stories of some seventy men and women, from all walks of life and from every nook and cranny of the Catholic Church in Australia. In the process he covers many aspects of the chequered and often fraught history of Australia as well as the chequered and often fraught history of the Catholic Church in Australia. But the stories also confirm that the ‘fundamental and attractive values of our society’ are alive and well, in the lives of both Fr Campion’s subjects but also his readers. And there can be no doubt that Fr Campion’s stories are providing many stories, parables and symbols, which confirm and bolster the very real success of the Australian national narrative. This is not to say that he pulls no punches. These are not just stories of cosy Catholic families, reciting the Rosary every night, with a stay-at-home Mum (who may have given up a promising career or neglected a nascent talent to cook and wash for her family) and a hardworking, conscientious Dad providing for his ever- growing good Catholic family. Although of course, there are such stories included in the anthology as they too are a quintessential part of the rich tapestry of Catholicism in Australian society. But there are also stories of failure, of injustices and mistakes; of dashed hopes and doomed dreams; of personal inner conflict and with overarching authority. The gamut of human experience is to be found within the pages of Fr Campion’s book. This is not surprising as his subjects represent the gamut of being human. Bishops (and the odd Archbishop), priests, members of many religious orders, some very well known and successful, others of more obscure origin and success, are all represented. The laity are by no means underrepresented, from convicts to academics. It is in their stories that the truly ‘catholic’ or multicultural aspect of the Australian Church is captured by Fr Campion. The stories of saints and sinners are treated with an admirable evenhandedness; no particular historical period of time dominates; immigrants from Ireland to France to Italy to the UK are all given a hearing; members of the working class to members of the judiciary are given equal weight. The accounts of the lives of these Australian Catholics range across centuries and all walks of life. There is a fine thread connecting several stories. A character who plays a small part in one story, may well turn up as the major subject in his/her own right several pages later. I was intrigued by how religious art opened possibilities of assimilation to several non-English speaking migrants. Several organisations, mainly lay, such as the St Vincent de Paul, The Grail, the Newman Society, all critical influences on the subject in focus, are a recurring motif. There are almost as many women’s stories, lay and religious, married and single, as there are men’s! Again women from all walks of live are represented from an UN representative to a sly grog merchant! Australian Stories Lives is a very accessible read. The chapters are short, – no more that three pages long, succinct yet amazingly informative. 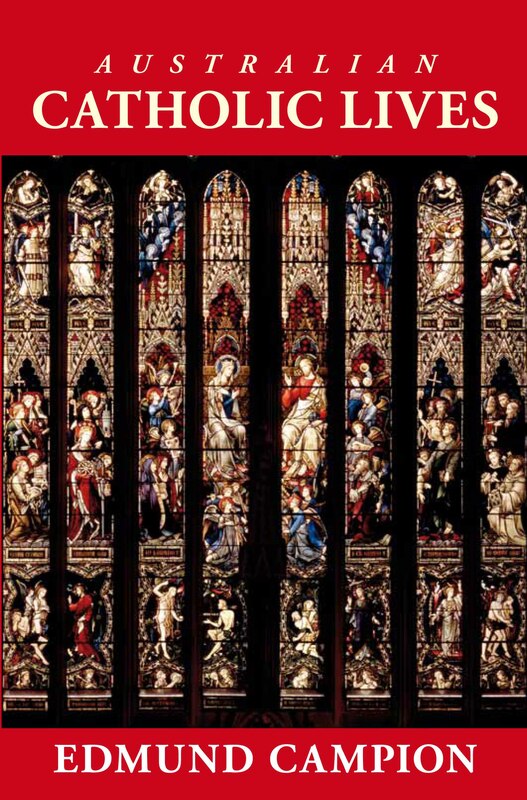 The cover, of the stained glass window of St Mary’s Cathedral in Sydney, is impressive. If there is something to complain about it is that in many cases, the constraints of the three-page presentation mean that there is simply not enough information – particularly about the spirituality – of its subjects. But this shortcoming is covered by the comprehensive list of both autobiographies and biographies of the people of this book in the Resources Guide. The intended audience for Australian Catholics Lives is school and clerical libraries, teachers and pastors. It is also ideal for ordinary folk to dip into in a quiet moment to read how other ordinary folk like themselves led lives, true to their own faith, in spite of vicissitudes and adversity. Perhaps its most enduring quality is to remind us, that when our society is shaken by the brutality – and appeal! – of so-called ‘death cults’, the grace of God is operating, alive and well and manifest in the social history, past and present, of ordinary folk going about the business of the pursuit of sanctity.